We will start with setting up a single failover cluster consisting of two PRTG core server installations, each running on an individual server. Use your license key twice to install the PRTG core server on two different computers. Before you start to set up a cluster, make sure you run exactly the same PRTG version (build number) on all (future) nodes (install updates for existing installations, if necessary). For details about the installation process, see section Install a PRTG Core Server. Decide which of your PRTG core server installations will be your future Master Node. If you already have an installation of PRTG in your network running for some time, this should be your master, so your existing monitoring configuration is kept. Enter the other settings as defined in the settings of your Master Node. Make sure you use the same settings on all nodes in your cluster. 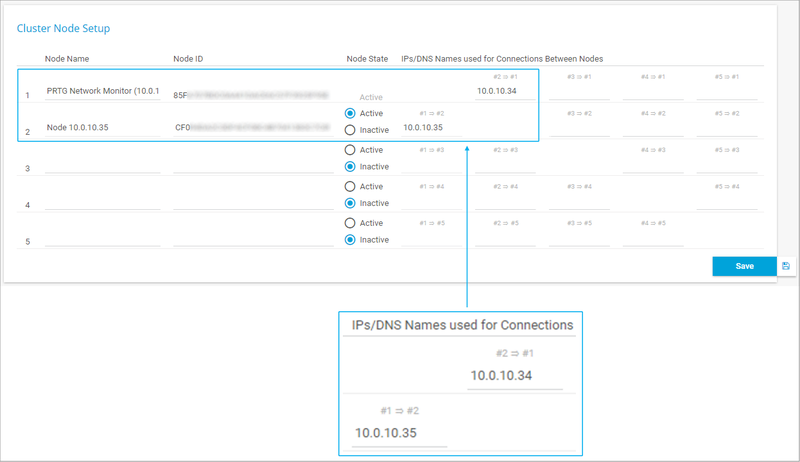 If you encounter connection problems between the two cluster nodes, make sure no software or hardware firewall is blocking communication on the cluster port defined during cluster setup. Communication between the nodes must be possible in both directions in order for the cluster to work properly. In a cluster, only core servers running on the same size of license can be combined. For example, you can use several "PRTG 5000" licenses or several "PRTG 1000" licenses in one cluster. To add another failover node to your cluster, set up a new PRTG core server installation on a new server, using an additional license key. Then proceed with Step 3 and following. Use a second license key to set up both your second and third failover node, and use a third license key to set up your fourth failover node. Each failover cluster is technically limited to five cluster nodes: as a maximum, you can run one master node and four failover nodes in one cluster.